March 2, 2013 By Tina M 21 Comments This post may contain affiliate links. Read my disclosure policy here. I’ve been really excited this week about these free applique designs that we made for you! They can be printed from your own computer onto Iron on Fabric Transfers. So where did the inspiration come from? I went to a baby shower once where there was a “onesie station.” We all sat around with fabric paint and markers and decorated onesies. I thought it was fun and an adorable idea, but none of the onesies turned out cute enough that the mom would actually put them on her kid. I have seen some adorable appliques that you sew on, but I like to minimize sewing as much as possible! The fun thing about these is they don’t cost very much to make, and you can make them very quickly! You can also customize them however you’d like , which would make them fun for a baby shower station. I added iron on rick rack to the birds, and buttons for eyes, and you can add bows or flowers to the necklace design. 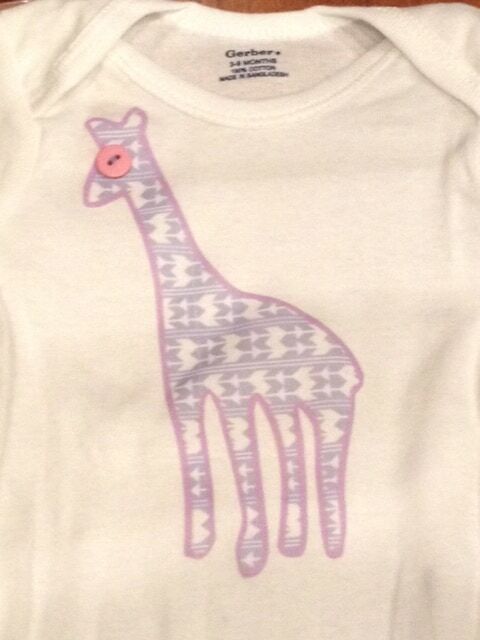 We also included some 1-12 , month onesie appliques for keeping track of your baby’s growth! Don’t pay for these on Etsy when you can easily print them off from your computer and iron them right on! If you do these for a baby shower, you can either have the designs already ironed on and then let everyone customize and give them some “bling,” or you can have a separate little area for cutting and ironing, and another for customizing. We have free applique designs for boys coming soon, so make sure and subscribe to the blog to keep updated. Tie and suspenders anyone? *Fabric transfers: If you buy these from your local store (I bought mine at walmart), make sure you get them from the office supplies section and not the craft section! I learned the hard way. The ones from the craft section do not work at all! *Follow the directions. Iron on a hard surface, and when you think its ready test one of the corners first. The paper should peel away without too much force. * Print onto computer paper to make sure everything fits on the onesie correctly before you use up one of your transfer papers. If you are using a newborn onesie, you can use the snipping tool, or powerpoint, or whatever program you like to use to shrink things down a little bit. On the pdf file, just go to “Edit”, then “take as snapshot” and then paste it into your program. *We are offering these to you for free. We’d love it if you would like our blog on Facebook or subscribe as a thank you! Have fun! I’d love to see how you end up using them! Check out my post on using iron on transfer paper to make your own felt pieces for a flannel board! That is a brilliant idea! What a fun thing to do at a party! That was very sweet of you to share the designs too, thank you! And thank you so much for linking up to Making Your Home Sing Monday today! These are so cute! Thank you for sharing! I’d love for you to check out our Pattern Party! Those with free patterns and templates to share are invited to link up! These are so cute! I’ve done something similar, but these turned out awesome. Oh my gosh those are adorable! I just love the little necklaces! If you have a blog hop, please check out The Linky Love Party…a place to share your parties with other bloggers! Grab the button for an easy way to search for parties every week! These are so cute! I wish I would have found something like this when my son was a baby! Thank you for stopping by Domestic Superhero Sharing Thursdays to share this! These are just adorable, and such a wonderful idea. I love the pearls and can just see a little girlie-girl wearing that onesie! Thank you so much for the transfers! Very cute!!! I love this idea and thank you SO much for putting the printables on here for FREE. 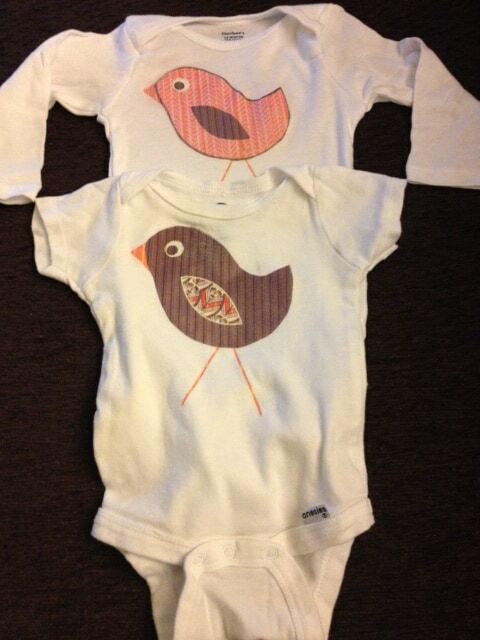 I’ll definitely be printing these off to make a onesie station for my sister’s baby shower this weekend. Love this! Do you know how well it holds up in the wash? I would love to make some of these but I don’t want it to come off when I throw it in the washer! Has anyone else had a hard time with the giraffe pdfs? I keep getting a onesie in the background. The other files are fine. Me too. I was only able to print the others. Thank you for sharing! 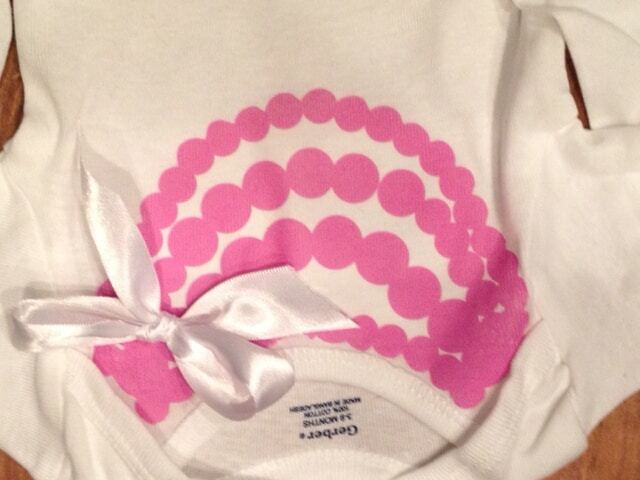 I have plain white onesies we received at a baby shower and iron-on transfer paper I used for a different project. It may look like a no-brainer but I’m so glad I stumbled across this idea on your page. Maybe being pregnant and raising a toddler has made me brainless… Anyway, thanks!